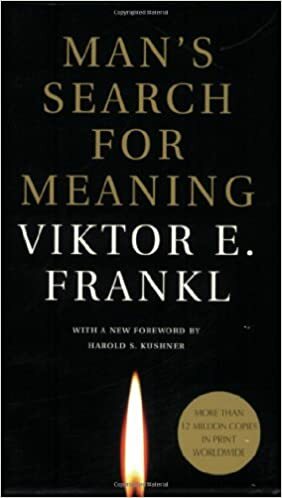 Viktor Frankl's book, Man's Search for Meaning, was first published in 1946. The first half of the book is about Frankl's concentration camp experience, while the second half is about his theory of psychology. When living in a Nazi concentration/death camp, Frankl noticed that prisoners who had a hope in the future had a better quality of life, even if they were ultimately murdered by the Nazis. Below are a few of my favorite quotes from his book. He who has a why to live for can bear with almost any how (Nietzche). Everything can be taken from man but one thing: the last of human freedoms, to choose one's attitude in any given set of circumstances, to choose one's own way .... Fundamentally any man can, even under such circumstances, decide what shall become of him, mentally and spiritually. No man and no destiny can be compared with any other man or any other destiny. There is a commonplace truth that no one has the right to do wrong, not even if wrong has been done to him. Those who knew that there was a task waiting for them to fulfill were most apt to survive. Live as if you were living already for the second time. To suffer unnecessarily is masochistic rather than heroic. Man does not simple exist but always decides what his existence will be, what he will become in the next moment. Man has both potentialities [good and evil] within himself; which one is actualized depends on decisions but not on conditions. Don't aim at success - the more you aim at it and make it a target, the more you are going to miss it. For success, like happiness, cannot be pursued; it must ensure, and it only does so as the unintended side-effect of one's dedication to a cause great than oneself or as the by-product of one's surrender to a person other than oneself. Happiness must happen, and the same holds true for success: you have to let it happen by not caring about it. Have you read Man's Search for Meaning? If so, what did you think about the book?